To get acquainted with the past and the present of the city you can with the help of our overview excursion. Eight-hour excursion cover historical city center, the City of Science and Art that is the symbol of modern Valencia. You will see XV century Benikarlo Palace and Saint Virgin Mary Royal Basilica. 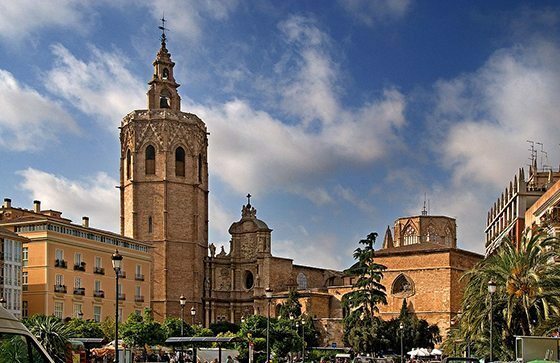 Also you visit a Gothic Cathedral with its museum, admire with the beauty of Apostol, Gala and Palace Gates. During the excursion you will see a beautiful altar, Borgia family chapel and Sacred Bowl chapel. One of the points of visiting is Saint Catalina ancient church. The construction of the church started in 1245. You will get acquainted with a beauty of Gothic architectural style, Valencia Silk Exchange! After walking tour you will be brought to a grandiose Valnensiya Scientific Entertainment Center or another name is the City of Science and Art. This complex includes five buildings each of them definitely will surprise you: The Opera Theater, the Oceanarium, the Garden, the Museum of Science and the Entertainment Center with planetarium, IMAX movie theater and theater of laser performance!